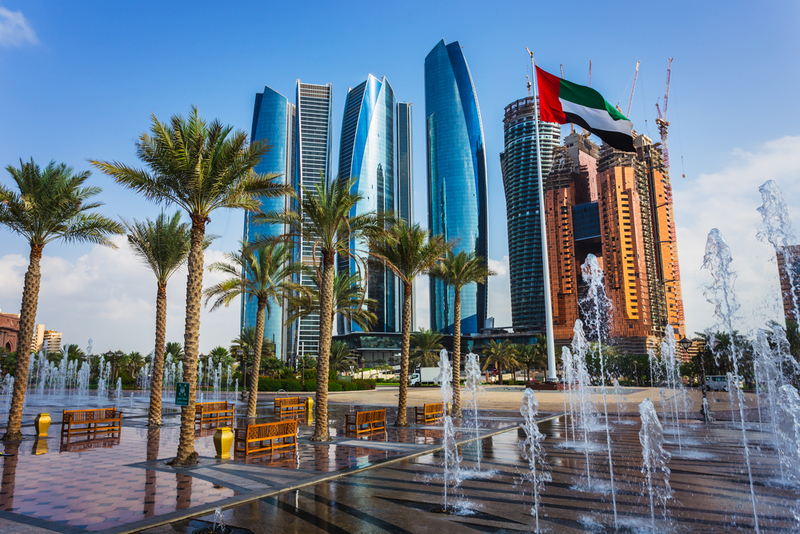 The Gulf States are steeped in history but nowadays are also as much about extraordinary modern architecture and extravagant shopping malls – complete with indoor ski slopes and giant aquariums. 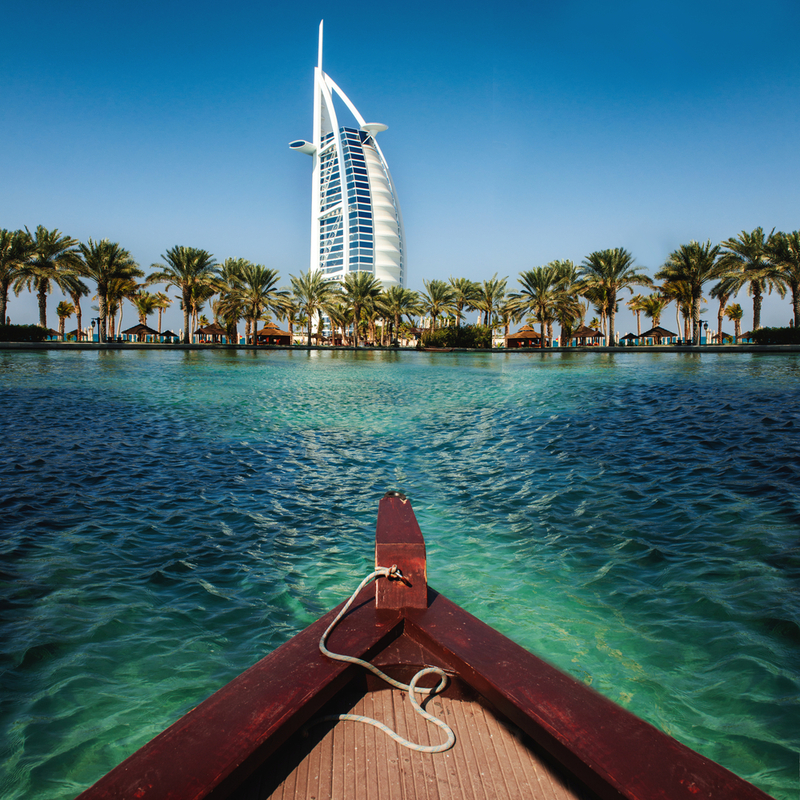 As Susan Parker finds, there is a rich variety to explore and enjoy – from wadi bashing to golf, from mosque to fort, from souq to shopping mall and dhow to opera house. Passengers arriving in Abu Dhabi are greeted with falcon displays, henna artistry, music, traditional dancing and Emirati food cooked in a traditional majlis tent. A permanent new terminal will open at the end of this year; visitors who prefer not to take a taxi could hire cycles for a ride along the Corniche into town. 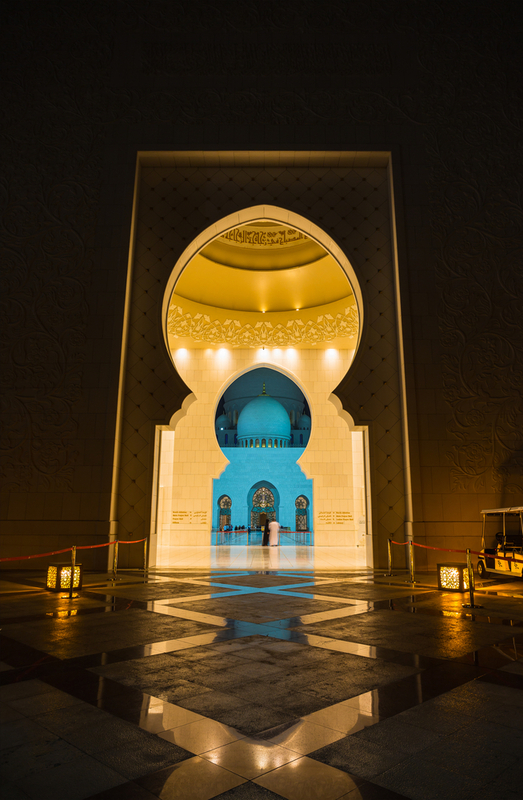 The Sheikh Zayed Grand Mosque, eighth largest in the world, is not to be missed. The Marina Mall or newly opened Yas Mall will both do damage to your wallet. The latter has a direct link to Ferrari World, the largest indoor theme park in the world. The neighboring Yas Marina Circuit offers exhilarating visitor experiences while Yas Waterworld has 45 rides to choose from. Heritage Village offers a glimpse of life before oil. There is a souq and museum, examples of houses and tents and craftsmen at work. At the other end of the spectrum is the Emirates Palace seven-star hotel which cost US$6bn to build and is of Arabian design. The Emirates Palace Hotel’s Mezlai restaurant claims to offer authentic Emirati dishes (in the same way that London’s Savoy does afternoon teas). Nearer is the Beach House at Park Hyatt with rooftop seating and situated on a protected white sand beach. The Al Dhafra dinner cruise on a traditional dhow is a wonderful way to see the city’s dramatic skyline. Abu Dhabi’s beach is not welcoming for Western tourists in skimpy swimming costumes, but the Emirate is creating a private island resort which will welcome cruise passengers within the next 18 months. Dubai makes life easy on arrival at the terminal. Passengers can change money, post cards, connect to free WiFi or purchase a range of goods, from electronics to souvenirs. City maps and brochures in different languages can be found at the tourist information desk. For serious retail therapy and every designer name imaginable, take the free shuttle bus to one of the giant malls, but for something a little more authentic Bateel is the place to buy a range of dates – one of the most traditional foods. Deira Spice Souq is a feast of colour and certainly cheaper than the Gold Souq. The Sheikh Mohammed Centre for Cultural Understanding offers guided walking tours of Al Bastakiya, built in the 1890s. Follow this with an Emirati meal while chatting with a host about culture, customs and religion. To sample Shisha and Moroccan tea, Khan Murjan Restaurant designed around an open courtyard is a welcome respite from the adjacent souq which sells handicrafts, jewellery and more. For true Emirati cuisine Al Fanar Restaurant is an option or for budget-friendly catch of the day try beach shack Bu Qtair. A little more upmarket is Aprons & Hammers historic dhow for freshly caught seafood. Frying Pan Adventures offer culinary walking tours to find the ingredients to prepare an authentic Arabic meal – an alternative to the inevitable visit to the observation platform 124 floors up on Burj Khalifa, the tallest manmade structure in the world. It’s a 20-minute stroll from Sultan Qaboos Port to the Mutrah Souk and Fort or you can pick up a taxi. From here one of the best and easiest ways to explore Muscat is to take The Big Bus Tour which has 10 stops across the city and runs every 30 minutes from nine to five. 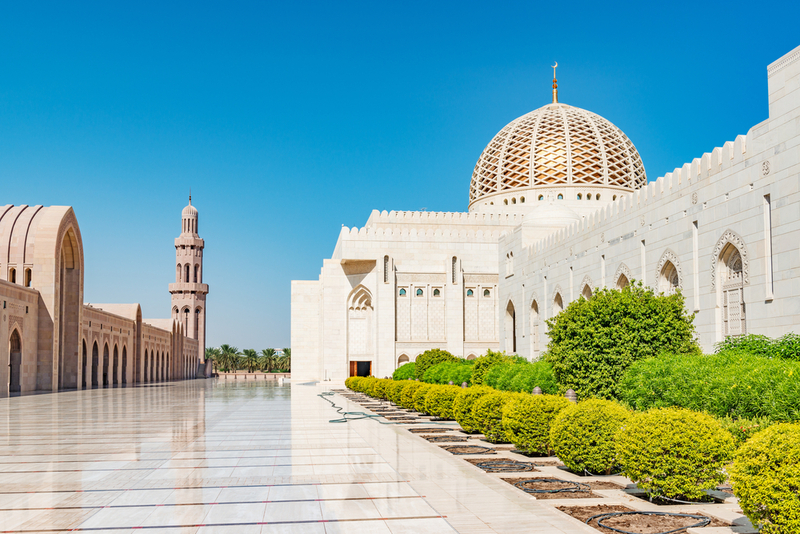 Among the most recommended places to visit are the Mutrah Corniche, the Old Muscat Quarter with a variety of forts, castles, mosques and museums, the extraordinary Royal Opera House which opened in 2011, Sultan Qaboos Grand Mosque (only before 11am and not on Fridays), or the fascinating private museum Bait al Zubair which displays the family’s collection of Omani artefacts. There’s a host of restaurants to choose, ranging from the simple to the luxurious, from traditional Omani to international cuisine. For me the preference is always something a little more in keeping with the place I am visiting so I would head for Ubhar near the Royal Opera House. Here you can try dishes such as camel biryani or fish machboos followed by such delicacies as frankincense ice cream, saffron creme brûlée and Omani halwa. In the same district is The Turkish House. Its simple decor contrasts with a delightful spread of Turkish and Levantine cuisine. Nature lovers can enjoy dolphin watching and golfers can choose from three 18-hole courses. 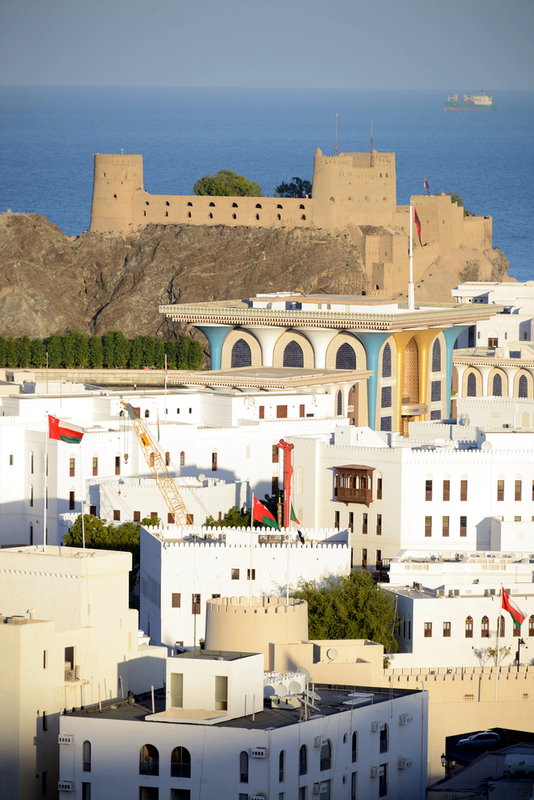 To explore further afield it’s a 90-minute drive to the 17th Century Nizwa fort. To arrange independent tours, contact local operators khimjistravel.com / panorama.co.om.